Return To Aveley With Glenda - a Memory of Aveley. A memory shared by Colin Newberry on Apr 10th, 2014. Send Colin Newberry a message. Fascinated to read this! I'm June Girkin (well, not any longer as I'm married). 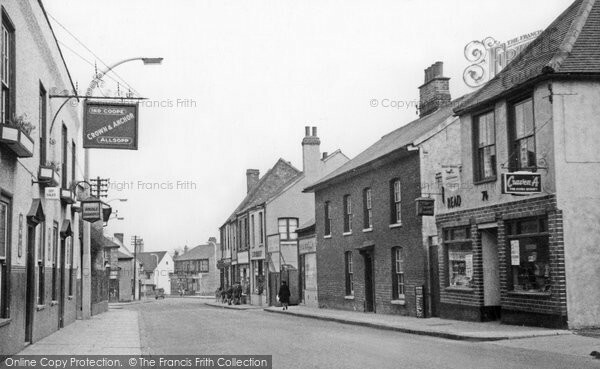 I lived in the High Street next door to David Shelley, and opposite the old Maltings and the dirt track leading to the allotments and my grandparents' house in Mill Road. Francis, why don't I remember you? I remember you, Colin Newbury, and David Warren, Kevin Savill and Trevor Johnson. And the Peter whose mother ran the sweet shop. My mum, Chris, worked there for years. I thought everyone would have forgotten the quiet little mouse that I was but would remember my brother David, otherwise known as Buster Girkin, and perhaps my eldest, football-playing brother, Roy. Ronnie Eggleton and Tommy Ferguson both came to sticky ends, if memory serves me correctly. Ronnie, as you said, went through the windscreen of a car and was impaled on fence spikes. I think Tommy fell out of the big oak tree in Belhus Park and broke his neck, but that would have been a few years earlier. They were both terrifying, but my connection to my well-known brother Buster kept everyone well away from me. My second cousin, Brenda Thorogood, six months my senior and living five doors down the road, was my closest friend during those early days, and we often cycled off for picnics to Running Water Brook and Belhus Park. Her father's family ran the coal yard at the bottom of the High Street. My father was very involved with Aveley Football Club and, being a carpenter, was one of the leading lights in the building of the stand there. My mother did voluntary work in the tearoom during matches, making and selling sandwiches and tea. And every Sunday, we all got dressed up in our 'Sunday Best' and strolled up and down the High Street. Gosh, what a long time ago it all was! Hello June. Great surprise reading you here on a Monday morning. By the way, I wrote another long memory (my first) "Living in Aveley 1948-68" (my first batch that Glenda replied to). Maybe you can find it on this site (sometimes I find it a little confusing to move about), and a lot should ring a bell if you do find it. I remember you with your curly almost "unruly" hair (no offence) living next door to the Shelleys. Mr Shelley was in the Aveley Silver Band. Mrs Shelley must have died of cancer, I think. I can remember visiting her in a London hospital with David ("Tiggie"). The name "Buster" given your brother is also familiar. Tommy Ferguson fell out of a tree while birdnesting - I think. There was a bullying gang down at the Junior School (Eggleton, McConnell, Cavanagh, Ferguson) who made every break (or play time, whatever it was called, a horror. The name Thorogood comes back now too. And you also went to Running Water Brook! The wooden stand at the Aveley FC ground - I remember sitting on it. More names have come back to me: Michael Kennard (the best athlete we had, and who I seem to remember once showed Ronnie E. what's what and left him draped over a dustbin in the playground); Jeff Collins also belonged to our little group (he was/is a Catholic, and his mother was also trying to get him to go to church - I went with him once as "moral support", but it was only a hall over Belhus somewhere, and it was then that I first discovered what Mary fanatics these Catholics are). They are here too in Catholic Bavaria of course. That's it for now, I reckon. But we're bound to dig up some more. Bye, Colin Newberry (then 22 Arnhem Avenue) (e-mail: fachfrisch@gmail.com).